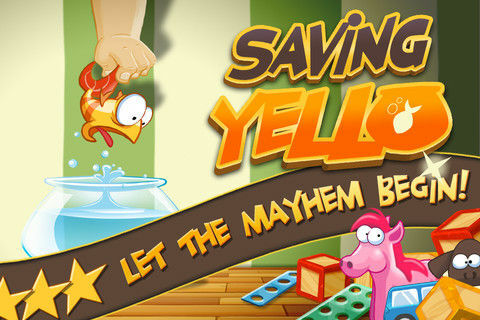 Saving Yello is a cool puzzle game for Android and iOS devices by DreamFab gaming firm. Company has made two games in this series of Yello fish based games. Saving Yello is the first game and Chasing Yello is the second one. We missed to review this game when it was launched. In this game you will find a cute gold fish Yello. You will be helping it to reach its bowl by using game controls. Graphics and background details in the game are really good. Sound effects used in the background for destruction of toys are also pretty good. You will be controlling Yello like a sling shot and shooting in particular direction to destroy toys and to reach its bowl. There are lots of power ups in the game to use. There are 50 levels of fun in the game but only 10 levels are free. You will need to buy full game to play all the levels. So over all it is a good game to enjoy in your free time. Graphics of Saving Yello are in pure cartoon style and the details are good. Sound effects used in the game are enjoyable. Controlling is easy like using a sling shot by tapping and dragging on the screen. There are 50 cool physics based puzzle levels in the game, only 10 levels are free to play. There are cool power ups to use in the game.